The recent International Air Transport Forum in Ulyanovsk showcased the important progress made by Russia’s aviation industry, but also underscored its difficulties navigating financial, industrial and political pressures. The immediate future of the Russian aviation industry depends on the fate of Sukhoi’s SuperJet 100 and the Tupolev Tu-204, two aircraft with very different trajectories. The SuperJet, the first Russian plane to be developed entirely during the post-Soviet era and to use a large number of foreign components passed an important milestone last month, successfully completing its first commercial flights under the colors of Armenian carrier Armavia. The second aircraft, the Tu-204, which flew for the first time in 1989 and looks much like the Boeing 757, is having difficulty reinventing itself; only 69 have been built in 20 years. Commercial operation of the Sukhoi SuperJet should allow potential buyers to verify the aircraft’s data and hopefully convince new airlines to see it as a viable purchase. There are currently 150 orders in place for the 100-seat regional aircraft. The positive mood over the SuperJet’s launch, however, has been somewhat dampened by repeated hold-ups in delivery of an order to Russia’s flagship carrier Aeroflot. In April, Russian Transport Minister Igor Levitin suggested that Sukhoi owed Aeroflot compensation for Aeroflot over the delays as well as disappointments over higher weight and lower energy efficiency than was originally stated. Aeroflot, which was due to receive its first SuperJet in May, won’t begin using the aircraft on commercial flights before the end of June. The situation with Aeroflot “reduces the appeal of the product in the eyes of potential buyers and could lead to state money being spent in vain,” said Maxim Pyadushkin, a leading expert in air transport. And yet the SuperJet is in a better position than the TU-204, a medium-range plane capable of carrying 210 passengers. An order for 44 aircraft from the airline Red Wings was supposed to kick-start production, but that deal has been in doubt since late April. The two factories that build the Tu-204s (KAPO in Kazan and AviaStar in Ulyanovsk) produce at most one or two aircraft a year. The Red Wings contract for the Tu-204s was supposed to provide some fanfare for the opening of the Ulyanovsk International Air-Transport Forum to open with some fanfare. Without the deal, the atmosphere was more subdued, although industry leaders still announced ambitious plans. 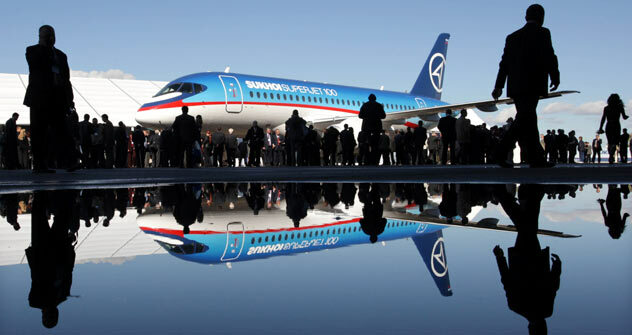 United Aircraft Corporation (OAK) head Mikhail Pogosyan, still basking in the glow of the SuperJet launch, announced that a consortium of Russian aircraft manufacturers would build 30 planes in 2011, up from seven last year. In particular, he expressed a hope that, with the help of the government aviation industry stimulus program, Russia will be able to claim a 10 percent share of the global civil aviation market by 2025. The government program is focused on three aircraft, the SuperJet; the MS-21, a medium-range aircraft with a capacity between 150 and 210 passengers; and a 300-seat plan aimed at low-cost carriers dubbed the Samolet 2020. The MS-21 is currently in development and is expected to be commercially available in 2016. It is partially based on the Tu-204. The Samolet 2020, as its name indicates, is projected to be available in 2020. Several areas of disagreement emerged during the course of the Ulyanovsk forum, particularly when industry veteran Oleg Smirnov criticized “all these bankers who now run our industry,” a comment aimed at Aeroflot CEO Vitaly Savelev and Alexander Lebedev, a stakeholder in several airlines. The industrial logic of concentrating production in one center naturally clashes with a political reasoning that seeks to maintain employment levels in many locations (the factory responsible for final assembly of the SuperJet is in Komsomolsk-on-Amur, located about 7,000 km east of Moscow). At the same time, financial considerations push airlines to buy foreign aircraft with much lower operating costs. None of this suggests that the state, as it pursues its main goal of reviving its national industry, will simply leave Russian airlines free to fall for the charms of Airbus and Boeing for the foreseeable future.